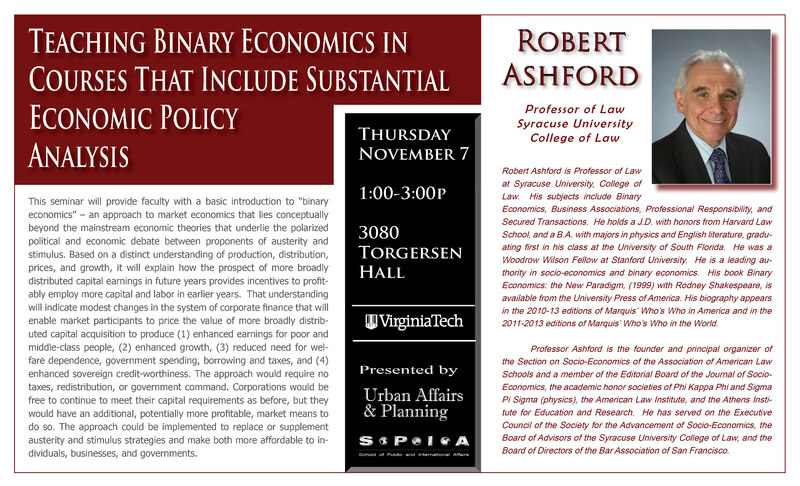 Prof. Robert Ashford will be teaching a seminar for faculty and doctoral students at Virgina Tech on “Teaching Binary Economics in Courses That Include Substantial Economic Policy Analysis.” The seminar will be offered through Virginia Tech’s Network Learning Initiatives (NLI). The seminar will provide faculty and doctoral students with a basic introduction to “binary economics” – an approach to market economics that lies conceptually beyond the mainstream economic theories that underlie the polarized political and economic debate between proponents of austerity and stimulus. Based on a distinct understanding of production, distribution, prices, and growth, Prof. Ashford will use a binary economics lens to explain how the prospect of more broadly distributed capital earnings in future years provides incentives to profitably employ more capital and labor in earlier years. The seminar will be a great opportunity to learn from one of the leading binary economist in the world.